The sun was setting as I ran through the forest. I could feel eyes on my back as I tried my hardest to run faster than her. My legs moved swiftly from the forest ground, and I could just barely make out her footsteps above me as she jumped tree to tree. I was breathing heavily by then, and I was sure the blood on me could be smelled from even miles away from her. It was absolutely sure: I wasn’t going to get away from her. The only thing that kept me running this far was the adrenaline in my body that was pumping rapidly through my system. Each step I took brought pains through my ankles and up to my spine. I knew I wasn’t going to last much longer. I could see a clearing up ahead and I knew that was the end. The trees were the only thing that kept her from charging at me. I entered the clearing and stopped just in time. It wasn’t just a clearing; it was a clearing that ended up being a cliff. Below the cliff was an enormous river that went at least a mile wide. The current went fast into the white waters, daring anyone to step in its turf. I had struck a dead end. I took a deep breath and turned to face my enemy. A rumble was made from my throat, coming out in a growl, and I knew the beast inside me was trying its hardest to not come out. My eyes flashed in color as my pursuer lifted both her hands up in a calming gesture. Her deep red eyes softened and became a burgundy color, telling me she had no intention to fight. “Why?” I growled out, “I did nothing wrong. Why are you after me?” She shook her head and took a step towards me. “No! Get away from me!” I took a step back and balanced myself when my foot touched no ground. She looked stricken, like she was deciding whether to jump near and push me away from the cliff or rather just push me off to get my death over with. My experience with her kind made me decide immediately that she wanted to push me off. As she took another step towards me, I felt my anger reach its peak. As I slowly felt myself give into the beast, the women in front of me sprang. I was about to push her away, but she did something that surprised me. The beast inside stopped as I felt her lips touch mine. I froze, widening my eyes. I felt myself slump into her, for I didn’t know what to do. Electricity flooded my body, making me immediately react to it. I pushed her away from me, and I felt my feet touch no ground. As I fell down from the cliff, a hand reached out to me and took my hand. I dangled down from the edge. She was the only thing keeping me above the water. She looked at me desperately, trying to pull me up, but I pulled down. I didn’t want anything to do with her. “Please…” She said, begging. I shook my head slowly. I could hear the water below me, daring me to fall in. “I don’t know why you’re after me…but I don’t want anything to do with the kind that hunts mine.” I let go of her hand. That last thing I felt before hitting cold water was confusion as I heard her scream my name. It was a bright and clear morning, one of the best mornings I have seen in a long time. The sun was shining down on me as I was making my way through the plentiful trees that surrounded the country landscape, and the sounds of all the wildlife that inhabited the lush green forest were like a symphony to the ear of any traveler. It has been three days now since I left Kirkrun, a little town not to far off from the Eastern city of Dover, and for once my travels have been quite uneventful, except for the weather, which has been undyingly atrocious until now. For nearly the past month it has been raining non stop, I cannot tell you the last time I have seen a clear day, hell, I cannot tell you the last time I had a warm bath and dry clothes, but since a warm bath is probably out of the picture for today, I guess enjoying the clear sunny day will have to make up for it. As a response my partner in travel, Francis Talliver, jumped down from the current tree he was resting in and landed right next to me after doing a frontal flip in the air. Sighing in an exasperated way, I gave him a playful smack to the back of his head while proceeding to call him a show off before continuing my way ward travel through the foliage. Rolling his eyes, Francis began to follow me on foot this time while keeping that ever most peeked vigilance he always carried with him. All in all, the joys of the sunny day could be less of a concern to him, over the joys of his own public safety. Wanting to live ‘till tomorrow instead of living in the moment was always his primary concern, ever since he joined my movement on this refugee trail. Around high noon we came upon the banks of a river, a river with parts shallow enough in means for us to wade across most of the way and not spend to much time swimming. Not wanting to run the risks of moving through the rivers currents just yet, I made the express decision to take a little rest, much to my partners enjoyment. Not even five minutes after I settled myself, and my pack down at the base of a tree, I noticed Francis acting a bit strange. For the sake of my sanity, as well as his, I tried to lighten the mood and get him to relax. “Exactly that,” he replied a bit nonchalantly. “Don’t pin that on me, Faraday had it comin’ tah ‘im and ye know it bloody well did Francis!” I yelled back, starting to loose my cool. Honestly, after Francis’s last little outburst, I didn’t know how to respond back to it. What if he did die, would I feel any compassion to his passing, or will I still have that ever growing need of survival nagging at the back of my head? Even better, would a sense of paranoia ever develop in its place? I for one had no reason or cause to tell if that would come true. But unbeknownst to me, some time during my little pause Francis just up and ran off in what I assume had something to do with his angry fit. Where he went? My best guess was he went to sit up in a tree in an attempt to both keep lookout, and calm his nerves…be alone with his thoughts. He really has been on edge recently, the loss of Faraday really has hit him hard but all men must die eventually. Mourn the lost in the moment of death, not the days following, that has always been my policy. But it was in these moments that he was gone however that I started to do a lot of thinking. What was my purpose, what were the reasons I was running and hiding…what is the real reason why humanity, and all the creatures that share this world with humanity exist, those were some of the many thoughts haunting me at the moment. But also during this times of thinking, I came across something most peculiar to me. Having spent an extended time down by the river, I listened to my thoughts, and the surroundings of the area I was currently residing in. I also did round about checks almost constantly, for I was starting to grow a bit paranoid myself of what could be lurking in the underbrush of a bush, the branches of a tree, even in the earth right beneath my feet. Those are the kinds of feelings any sane man would be experiencing if they knew they could die any second. It was in those moments down near the river I was resting in front of that I noticed something, or should I say someone. A female woman, I’d say between the ages of 20 and 30 was lying almost face down in the river, caught on what looked to be a piece of adrift wood. Since there was nothing better for me to do at the moment, and being the kind of selfless human being I was, I saw it fit to try and help this young woman. Taking a risk I waded out into the depths of the dark water to and retrieved her, bringing her back to the safety of dry land. Laying her down in a patch of sunlight I took a quick notice of how she looked. Her strikingly lovely auburn hair was soaked through and sticking to her body, as well as her clothing, but there was only one problem, she was not breathing. Fearing for her safety I began giving her mouth to mouth resuscitation until there was an eventual loss of water from her lungs and a slight rising and falling of her chest. Now that I knew she was still alive, it was time to move on to the more pressing matters, keeping her healthy. Going to my pack, I began reaching around for a blanket and any spare clothing I could find. Stripping this strange woman of her soaking wet clothing, I dressed her in what I had left, a loose fitting cotton shirt and a pair of slacks. Once done I wrapped her in the blanket to further help keep her warm and than rested her up against the base of a tree. Taking a seat next to her I began waiting, waiting for Francis to return, and for this strange girl, that for some reason I felt the need to help, regain her consciousness. Sounds of metal clashing against metal could be heard from within the halls leading to a stone circle that almost looked like a coliseum. Two young men were practicing swordfighting techniques. One who had curly brown hair and a thin mustache and beard was using a type of illusionary conjuring spell while the other who had neatly combed black hair and a slightly thick mustache and beard was fighting the projections using two swords. "How many times must I tell you? Try to control my center line," said Philip, using his projections of two knights while use his movements to have the knight match it. The first struck downwards with its blade while the second tried to strike at Kaname’s left side. 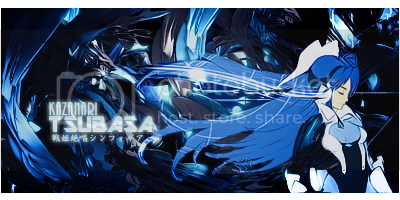 Kaname used Vanguard to block the second knight’s attempt while using Zephyrus to catch the blade of the first knight. Using most of his upper body strength, he shoved both of the knights back before twirling to his left and coming around and lunging forward did a cross slash maneuver at the mid-section of the first knight and knocked away his sword with Vanguard. Hearing the oncoming second knight from behind, he blocked the attack before swiftly turning and knocking away the sword with Zephyrus. Having both swords pointed at both knights, Kaname heard Philip chuckling and lightly applauding his friend for his efforts. “Nicely done Kaname…I certainly didn’t expect that one,” said Philip, lowering his hands. “You know you could always up the ante Philip,” said Kaname, sheathing away his swords. "Kaname...why can't we try and buy a horse for once?" asked Philp, catching his breath briefly before tossing Kaname his cloak. "Takes some work to caring for them. Besides...there's usually only room for two riders," he answered, putting it on. After finishing their training session…the two of them made their way through winding tunnels that were barely lit with a torch every 10-20 steps. “Are you sure you remember your way around this place?” asked Kaname. “Of course…I’ve been here lots of times,” said Philip. “And yet a network of tunnels could either lead us to a house, a castle, or even a church for that matter. How is it that you can easily recognize such a complex network?” wondered Kaname, keeping close to his friend so that he doesn’t get lost. to temporarily shield his eyes from the bright light of the sun. “I can see why you’ve become accustomed to being underground,” said Kaname. “I like to take a break every now and then,” said Philip. “What’s your current interest?” inquired Kaname. “Besides searching for answers to my past…legends and myths,” said Kaname. “You sure you want to know?” asked Kaname. “I don’t see why not,” replied his companion. Philip’s eyes went nearly wide like a round shield and he just stared at his friend incredulously. As the two of them worked their way through the busy streets, Kaname tried to keep a look out for an inn, while Philip was paying attention to their surroundings. It was quite lively at this time of the day, which explains why the crowds were so big. After several minutes of searching, Kaname finally came across an inn at the next corner they passed. “What was that?” asked Kaname. Once they entered, the strong smell of an alcoholic beverage hit Philip’s nose. “I don’t know if I can stand this,” said Philip. “Don’t worry about it…I’ll go get us a room,” said Kaname, walking up to the owner, who had a thick bearded mustache and was sort of chubby. “Good day young masters…you seeking accommodation?” he asked. “Yes…just for two. Here’s some extra money. We plan on staying for a couple of days,” answered Kaname, handing him some gold pieces. “You can take the room third door from the right. Enjoy your stay,” replied the inn owner. “Thank you,” replied Kaname, taking his companion along with him. Once they settled in the room, Kaname took out a small booklet and began writing something while his companion was sitting near the window looking outside. “It’ll be dark very soon. I suggest we get something to eat and then prepare for heading over to the archives afterwards,” said Kaname. “At night? !” inquired Philip, a bit uncertain. “What…you’re not afraid of the dark are you?” joked Kaname. “Oh…I see. Just wait here then. I’ll see what I can find,” answered Kaname. Kaname decided to head downstairs and asked the inn owner of the nearest tavern and headed out to get them something to eat. OK...whoever calls next after my post is free to make theirs. I'll just wait until I can read the other ones. The blonde stared despondently into the water, eyes darting furiously through the raging currents for any signs of the brunette who had thrown herself in. When she could find no such signs, her expression grew solemn as she bowed her head. After a moment, she shook herself out of her stupor before walking back into the forest, her solemn appearance melting into one of disappointment mixed with amusement. She traipsed into a clearing, where she was greeted by another blonde of similar appearance. Sighing dramatically, her counterpart wrapped an arm around her look-alike and the two started to walk out of the forest shoulder to shoulder. The first blonde, Alicia, frowned before lightly punching her sister on the shoulder. Elsewhere, in a castle renowned for never being conquered, the primary leader of the vampires of the region, Precia Testarossa, was consulting with her primary advisor in the privacy of her study. The vampire matriarch folded her hands together in contemplation. After walking around town, he noticed that at some corners it was eerily quiet. So quiet in fact that it made the hairs on the back of his head stand up slightly. Looking around, he eventually found one tavern not too far from where they were staying. chatter going about and people who appear to be having a good time…literally. “Can I help you sir?” asked a bartender coming back from cleaning several cups. “I was wondering when this place closes. I noticed that you had no sign outside as to when you usually operate,” answered Kaname. “It’s usually before the curfew bell is rung,” he replied. “I see. Do you have anything to eat around here?” asked Kaname. “You’ll have to ask the owner,” replied the bartender. “Where can I find him?” inquired Kaname. The bartender then pointed out to a man on the opposite side wearing white attire and what appeared to be a green vest with light red lines at the edges. Kaname gave a nod to the bartender before heading over. Back over at the inn, as Philip quietly waited on Kaname to return with some food, he then decided to take some time and do some quiet meditation. There was some activity outside and yet the moon had yet to show itself. However, it didn’t mean that all was peaceful. After roughly 10-20 minutes of waiting, Philip heard knocking on the door which interrupted his meditation time. Once opened, he saw his companion carrying a small plate covered in a white cloth and a couple cups filled with water. “What’s all this?” inquired Philip. “You said you wanted something to eat, right?” asked Kaname. “Managed to get some shepherd’s pie,” he answered. “What? From where?” asked Philip. “Don’t you want some?” offered Philip. “I haven’t forgotten,” replied Philip, taking a bite of the pie. After several minutes have passed, the pair then went downstairs to head out to the nearest archive available. Kaname told the inn keeper to let others know that their room was occupied. Putting on his cloak, Kaname then explained to Philp that as he was heading back to the inn, from a distance, the closest archive available to them was near a castle. Luckily for them, Philip knew an old friend that would grant them passage. “How long did you say you knew the old chap?” asked Kaname. “Several years actually while I was still under my master’s tutelage,” he answered. By the time they reached the archive, it slowly began to get dark. Kaname quickly took note and decided to act as a lookout while Philip went inside and found his old friend while explaining the situation they were now in. A couple minutes passed before Philip tapped Kaname on the shoulder and gave him a nod, acknowledging the fact that they were now given access. The foundation of the archive they were in appeared to be several years old, and still in good condition. The coldness coming from the stone walls brought the temperature down a little but the pair managed to keep up with their guide holding the torch. After going down a couple flights of stairs, their guide then showed them the door and opened it. Kaname found a couple of nearby torches upon entering and lit them. There were a couple of cobwebs hanging from the corners, the room itself was a little dusty. The shelves were slightly covered with dust as well including a few scrolls. Luckily, there were a couple of tables and chairs in which they could sit down and read some scrolls. Kaname only took three while his companion took several scrolls. “Think you’ll find any clues about your past here?” asked Philip. “Not that I would know of, except…a few bits regarding my current interests,” said Kaname. “You’re kidding…you already found some information?” inquired his companion. “Very little I’m afraid,” he replied. “What of it?” asked Philip. “Something about an amulet…and it’s not just one from a royal lineage either,” answered Kaname. Piquing Philip’s interest almost immediately, he quickly went over to where Kaname was reading the scroll. ‘Where have I seen this before?’ wondered Philip. “Is something wrong?” asked Kaname. “Huh…oh, no…nothing. I thought it looked familiar,” he replied quickly. Kaname then went into his clothes and felt his hands run through a thin metal chain until it held what appeared to be a diamond held within golden lining. Looking at the picture on the scroll he just unfurled, Kaname looked carefully at the design before looking back at the amulet he was now wearing. ‘I wonder…do these connect somehow?’ pondered Kaname. ALRIGHT...I'm not going to make the same mistake twice. I'll let Nanoha-san take the next post so that hopefully...the flow of this RP isn't interrupted again. I watched as my big sister made her way towards me, throwing an arm over my shoulder. I suppressed the urge to grind my teeth and growl. I couldn’t let her know my feelings at the moment. She would surely suspect something was up. Big sister was always one to figure things out; after all, she is mother’s first born. My first instinct was to run to the cliff and see if I could find her, but I knew that would be a bad move. This time I did grind my teeth, only enough to make big sister not notice. We walked for a bit not speaking a word to one another. I remember we were like this before she saw her walking and decided to chase. At that moment my heart squeezed as I saw who it was. Before I could stop my sister, she was gone, excited at her new catch. I chased after of course, but from afar, so that Alicia wouldn’t get mad and of course so she doesn’t notice. At the moment I was literally strategizing life or death situations. If I stopped Alicia now, surly she’d tell mother. I can’t let mother know, that was for sure. If I didn’t however, she would surly parish from Alicia. I know these parts like the back of my hind. I knew there was a cliff coming ahead, and I’m sure Alicia did too. She knew she caught her pray. We did not, however, expect her to jump. Though what was more surprising then that was Alicia’s attempt to kiss her. It took all my strength not to pry her off, and when she fell off the cliff, what another surprise that Alicia knew her name. I stiffened slightly. How is it that Alicia knew Nanoha’s name? I mean, it’s been years since I’ve seen her. Actually…it’s been way longer than that. I never expected to see her again. After what happened, I made sure I would never see her again. It just doesn’t make sense on why Nanoha is here, and that Alicia knows her. 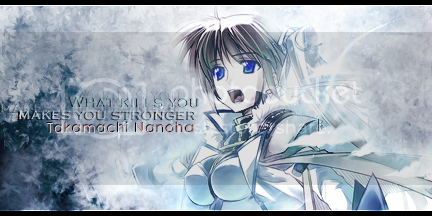 Nanoha’s eyes showed nothing but anger and hatred towards her. If she remembers me, she would have at least recognized the similarities that Alicia and I share. Or maybe she was just simply hiding it. Whatever it was, it made my heart hurt. I closed my eyes and breathed in a long sigh, then let it all out. I could feel Alicia’s gaze as I just looked ahead. I couldn’t look at her right now, something in my stomach was telling me not too. She let go of my shoulder and walked ahead. She spun around, waving her arms in the air. She looked to be in a happier mood. She stopped to look at where she was and turned around to look at me. I forced my gaze on hers. The smell of water and dirt hit my nose, making me scrunch my nose. I moaned out groggily, feeling my back slightly ache. I slowly opened my eyes to look at the scenery around me. What I saw was not where I expected to be. Trees were lined up, making it the only scenery that looked like for miles. I could hear the rivers current not too far away. I could feel my damp hair make knots on my back, making me wonder where my side ponytail went. I heard snoring beside me and I stiffened. I low growl escaped my mouth as I saw a stranger resting next to a tree. I slowly crept onto my legs to stand but I stopped. I was wearing different attire then what I was wearing before. Thoughts drifted into my mind, and I felt my anger increase. I growled. The man stirred slightly but I ignored that. I lifted the man off the ground and threw him a couple feet making him land on his back with a painful grunt. He jumped up ready to attack but stopped when he saw me. He lifted his hands up in an “easy” gesture and took a step forward. I kicked a rock up from the ground, caught it and threw it at him. It hit him leading to another painful grunt. “What did you do to me while I was asleep?” I demanded. He looked up, his face scrunched up painfully. “I did nothin’ to you luv’. I was merely helpin’. You see, I foun’ you lyin’ on the ground, unconscious.” I picked up another rock, and readied myself to throw. He backed up. “Easy lass, I’m tellin’ the truth. My tale is true.” I stopped for a second to think. I tilted my head to the side slightly. “You better be telling me the truth, or I swear, I’ll kill you.” He just nodded meekly. “Good, now please, explain to me what happened.” I remember everything up the part of me falling into the river. I thought I was going to die, I never expected to be in this situation. I thought at least that vampire was going to get me. I was on my way to the next town over, going to deliver some strawberries to one of the rich folk there. That’s when I smelled someone was nearby, and it wasn’t a scent that belonged to any humans, at least any normal human. Before I could see them, I started to run. I was in no condition to run though. Last night I encountered some unexpected people that made some trouble in my town so I decided to step in and take them out. What I didn’t know was that they were skilled assassins. I mean, I was still able to stop them, but I didn’t leave unwounded. So I ran, my arm wound reopened, and tried my hardest to lose them. After a while I knew I wasn’t going to get away, so I used my hearing skills to lead my way. I knew there was a river nearby but I didn’t think it was so close. When I reached that cliff I knew I was a goner, so I did the only thing I could. I jumped. I turned around to face another man. His face was tight as he went to stand beside Reo. My guard was up again as he stared intently at me. Rolling his eyes at my over blatant politeness, Talley took out a dagger and began sharpening it some ways away from me and the girl, in what I believe was his way of keeping watch for our safety now, while I waited patiently for this girls name. Coughing a few more times, I took a look at her face and found myself greeted with a very blank, very disapproving scowl. Think things over slightly, I immediately jumped to the task and said, “Oh I’m sorry luv, my name is Reo, Nicholas Reo, me friend over there is Francis Talliver, we’re a couple of rovers just lookin’ for the next nearest town and the next nearest line of work. Now luv, unless you want me callin’ ye luv all day, everyday luv, I’m gonna need tah know your name…luv. “Nanoha, Nanoha…quite a foreign sounding name ye have there, but I like it!” I said exuberantly, a bit too exuberantly I was guessing for someone’s taste because the next thing I knew, I had a large rock hit me square in the face, soon to be followed by a second, slightly smaller one, and than a third. Whether I deserved to be hit or not was not really the thing to judge right now, but stone to the face, I have learned, has never been more in excruciatingly painful before in my God given life. It made me want to say, ‘Damn, you have a good arm.’ But I was too busy saying other things at the moment. Covering my nose with my hand I could feel the obvious blood that was gushing out from it. It did not exactly dawn on me at that moment to find a method to clean it off, all I did was yell at profanities under my breath. Eventually I did calm down enough to get a rag to wipe down my nose and clean off the rest of the blood caked on my face and neck. It even gave me a chance to spit out the small chunk of tongue I bit off, as well as a chance to spit out a couple of teeth. Now, lying with my back against the base of a tree, I let out a deep frustrated sigh and just sat in the tense moment that this ‘Nanoha’ girl was making. Taking a look over in her direction, she looked both like she was sorry, and ready to tear my face off. It was only a matter of time before she spoke up saying, “It’s about time I get going…” Before letting it die down there. As she was getting up to walk away, she timidly mumbled the words thank you before taking about ten steps, away from the river, before collapsing. Sighing out again, I lowered the rag from my nose and said, “Let’le lady, yer not goin’ anywhare, at least nut untel those wounds of yers heal at least.” Even as I spoke, you could tell my nose was broken. “Says you!” She began to say again, completely disregarding what I said as she stood up, before taking about five more steps this time before collapsing. Chuckling lightly in my expense I let her struggle with her self a bit more before she gave a type of (was that whimpered?) cry and giving up. In all honesty, I had no real clue why she would have pain in her legs at all after lifting and throwing me...and kicking a rock up with her feet (somehow) to throw at me, but I was not about to ask any questions. Walking over to her I helped her get to her feet, much to her own delight, and helped her hobble over to the base of the tree I was resting at, before explaining to her the situation she was in. “When I found ye sever’ral pieces of stone stuck into yer legs, I had tah pry most of them out, but some I just couldn’t get. You shouldn’t move on yer legs all that much now luv…Nanoha. So until ye heal up, please rest.” For some reason, I could not help but somewhat plead for her to take it easy, probably just that nice guy intuition I have always had…it made me think of some, significant, other person I had waiting for me. At this point, both of us would try and make small talk the best way we knew possible, though it really did not work out all that well, we still somehow managed to get along, much to my partner Talley’s Annoyance. It was around this time in the lull in the day, when I was making something over a readily made fire, that I managed to ask Talley where we should head next. This, unfortunately in good will for us, peaked the interest of our brown headed guest. "Soooo", she drawled on in a very, very, uncharacteristically cute drone for her psyche that it made almost gag. “Where you two headin’~” At that point I would have sworn she was drunk, but I doubted it. I leave it for anyone to take it from here. I do expect Nyanoha to start working on where we'll be headin' next in our specific scene though. “Any luck so far?” asked Philip. “So far…nothing comes to mind,” replied his partner. Philip took a quick look at the scroll Kaname had in his hand and noticed a faint, but still visible image of a double-faced flower with a cross within the drawing, slightly faded on the top right corner. “So what do you recall about the conflict your late master had with this Elder vampire?” asked Kaname, breaking his friend’s concentration. “Not much…except for a couple of things,” said Philip. Philip was silent for a brief moment as he collected his thoughts while Kaname sat patiently on a silk pillow cross-legged, slightly rocking back and forth. “Did he ever find out the identity?” asked Kaname. “Not that I’m sure of. All I recall was that he once told me that there was a power struggle between three elder vampires. The one my master fought appeared to be one of those three…and that they were power hungry,” explained Philip. “Sounds like it got pretty ugly,” said Kaname. “Oh…it gets better. Two of the vampire elders were brothers. The third one was their mentor, an elder. Apparently, the two brothers had slightly different views on the world, as well as their enemies. One of the two was destined to lead the coven. They argued about it for quite a bit until something happened which caused the two to fight each other,” explained Philip. “Why would they need a mentor when they’re all elder vampires?” inquired Kaname. “The reason is because not everyone that is old, teaches the same thing. They may have similar ideals, but each is different. The same goes with mentors,” answered Philip. “So…what caused the two brothers to fight against each other?” asked Kaname. “One brother wanted to be immune to sunlight while the other wanted to have complete control over his adversaries,” said Philip. “That doesn’t appear to be possible in any condition. Sure you can have some control over one’s adversaries but to be in complete control…that’d take the power of something that would be extremely influential,” replied Kaname. “That was the bait that the mentor used against the brothers. You see…he tricked the brothers into thinking that such a feat was possible. He told them that he could teach them how to avoid sunlight and gain control over their enemies. In order to prove their worth to him, they would have to duel each other. The mentor knew of their bad family history and how much they got on each other’s nerves,” explained Philip. “So he used that knowledge to his own advantage,” said Kaname. “I think I’ve gotten the information I needed,” said Kaname, putting his small notepad in his left vest pocket. “Good, then let’s head back,” said Philip. As the two of them worked their way back up into town, Kaname quickly took note of the slight chill the night wind brought and quickly held onto the hood of his cloak. “I’ve never felt the wind blow this strongly before,” said Philip. “Aye…it’s as if it’s telling us something is going to be going on,” said Kaname. The two of them walked slowly back to the inn when Kaname blinked for a few seconds, scanning his surroundings. The area they were at almost appeared deserted. “That’s funny…I don’t remember walking down this side of town,” said Kaname. “Agreed…perhaps we took a wrong turn?” guessed Philip. “R-right,” said Philip, following closely behind. After taking several detours from passing closed stores to open bars, they eventually found their way back to the inn they were staying. Kaname took a look from the window in their room and saw the moon was already in a big crescent shape. “Philip…” began Kaname, as he looked at the night sky. “Is that so?” inquired Kaname. “Do you ever wonder if someone might have probably altered or erased your memories?” asked Kaname. “It has crossed my mind a couple of times…but I never actually considered it,” said Philip. “Looks like we’re both in the same boat then,” said Kaname. “It means that we’re both in the same situation,” said Kaname. “Oh…yeah…I guess you could put it that way,” said Philip. “Go and rest up, Philip. I’ll go and take watch,” said Kaname. “Are you sure?” inquired his companion. “Yes…I’m sure,” replied Kaname, as he took a chair near a small round table and placed it near the window before sitting down. As Philip crawled into bed, Kaname kept looking at the stars in the night sky and watched the clouds slowly cover the crescent moon, like cloth drapes slowly being pulled over to cover something. A few seconds later, he could hear the faint howl of a wolf and began to wonder. ‘Hmm…a regular one…or a werewolf…they’re both different, yet one carries something of a disease as a result of something,’ thought Kaname, as he slowly pulled out the slightly developed pendant from his neck and stared at the design. It had strange symbols etched into the sides and yet the metal itself looked slightly like faded gold which resembled like bronze instead under shadow. Kaname then walked over to where his partner was sleeping and blew out the candle before returning to being a lookout from near the window of the room they were staying in. Besides the fact that it's been a long time since this RP started, I'm guessing it's only going to get even slower. At least my fanfic version is going strong, despite the fact I do get writer's block from time to time. Anyway...I'll leave the next one to Nanoha-san, whenever she gets the chance to make her post. We've been walking for about thirty minutes, in silence, the only sound was of our feet hitting the ground. I'm use to the silence, it calms me. But as I leaned unwillingly against Reo, I could tell he was fighting himself to not speak. We were near the nearest village by now and I was glad that the small journey was going to end, so that I can just rest. I wouldn’t show it outside, but inside, I was hurting. I heard howling in the distance and my ears pricked up. Reo and Talliver didn’t really pay attention, nothing in their movement showed that they even heard it. I ignored it too; it wasn’t my kind, just some wild wolves. By instinct however, I felt like I should go help it, but I knew I couldn’t do that in my condition. The wolf would have to fend for itself for now. I looked up at the sky, looking at the moon. It would be a full moon in a couple of days, I could feel it. It was when my powers would increase in size, where I could be at my most best. I should start healing faster too, since the moon was out and in site. I was still looking at the moon when I felt eyes on my back. I didn’t stop to turn around to see who it was; I already knew it was Talliver. I could tell he didn’t trust me and I don’t blame him for it. I mean, if some random female stranger just appeared out of nowhere, I would be suspicious as well. He doesn’t have to worry though, I’ll be out of their lives soon enough. A couple minutes later, I could see the village ahead. The village of Clanagan was a big fishing town that’s been selling a variety of fish for centuries. The village provides fish for many neighboring villages making it a pretty wealthy place to live. Their town square was more like a trading post, where everyone from different villages would come to sell their products. I even come here to sell my strawberries and fruits on occasions. The place was always busy but unlike the other towns, there were always rooms to crash in. Since many people come across the country to sell their products, there had to be many places to rest for the day. When we were deep into the town, we found a decent enough tavern to stay in. We got a room (we only had enough money to get one room) and went inside to rest. I was now on the bed, resting, while Reo and Talliver were down at the bar. The place wasn’t too bad; we got two beds, one where I would rest and the other where Reo or Talliver would rest in. I wasn’t sure if they would sleep together in the same bed. There was a small bathroom in the corner where I changed my bandages, so now here I was, trying to sleep. I wiped my mouth with the back of my hand and stood up from the bed I laid on. I walked over to the only window in the room and stared out. I used my eyes and ears to look for any intruders that might be out in the woods. When I reassured myself that there was no one, I took a chair and sat down near the window. My mind was telling me, reassuring me, to forget about the problem. That the vampire wouldn’t come looking for me. I knew this was wrong though, I know how they think. I’ve been around for a long time, meeting many vampires. They were all the same. Once they found their prey, they wouldn’t stop till they got it. I would be ready though, to stop her. I looked farther into the woods, hearing more wolves howling in the distance. As if they were telling me something. Her teeth sank into the creature’s neck, blood immediately pouring into her mouth. She felt the power from it immediately come to her. She ignored the awful taste as the blood went down her throat and into her empty belly. When she felt that no blood could be taken from the creature anymore, she pushed it angrily to the side. She hated drinking blood. She hated everything about her really. She especially hated being a monster. A monster that she hated the most. She looked at the large elk she just drank and then left it to be eaten by the parasites. It wasn’t as good as human blood, but she promised herself that she would never drink from a human again. She promised her that she wouldn’t and since then, she has kept it. She thought she would be used to it by now but she never got use to the taste of animal blood. She disgusted herself for still being hungry. She looked up into the sky, watching the clouds slowly pass the moon. The crickets’ song was playing in the distant with the occasion of the owls hoot. She ignored the passing of small creatures making their way to shelter. Her thoughts were somewhere else. She was worried about her of course. Until now, she has been watching her sister like a hawk and its prey. She felt herself border into anxiety. “I have to get back,” She said. She didn’t trust her sister one bit. She loved her sister as sisters do, but for some reason, she could never trust her. Her sister was always full of surprises a treat she got from her mother. She also had the same aura as her mother at times too. She shivered at the thought. Fate was just about to turn around and go back home when she heard something in the distant. She was too busy with her thoughts that she didn’t realize that she was surrounded by wolves, none Her kind. There were about three of them, their eyes glowing in the moonlight rays and their teeth showing as they growled. This was a surprise for Fate, usually carnivores stayed away from her, feeling the danger. Stupid creatures. She thought. They must have seen the change in her mood because they pounced at her. Fate of course, blocked the attack with much ease. She backhanded the first one and side-stepped the other ones. The first one howled in pain but still stood its ground. The hot blooded animals jumped her again, not learning their lesson. The first one was smacked into a tree, leaving it motionless on the ground. She blocked the other ones smoothly. A small growl was heard in the back of her throat. She was getting irritated. As they attacked again, she grabbed one by the throat and kicked the other one into the woods. She bared her fangs at the wolf she was holding. The wolf whimpered. She threw it to the side and it scrambled up, fleeing into the woods. She heard them howl in the distance and she just laughed hysterically at it. She felt no pity. She turned to leave again but the site of the other wolf in the side stopped her. She felt a ping of regret as she remembered past events. Memories she thought she had forgotten came back like a new breath of fresh air (if she breathed). She shook it all off though, it would have to wait till she was back home, where she could think all she liked without being bothered by other wild creatures. She stormed off, leaving the wolf behind, trying her hardest to push away all the different emotions bundling up. Ignore the horrible grammar and shiz mistakes, I wrote this at night xP Sorry about this taking so long to post, I've been busy with school and other shiz.